I’ve recently started at Mount Stewart taking on the role of Project Conservator (ok I’ve been here 6 months), taking over the fabulous work Fiona Austin-Byrne was carrying out prior to leaving. Having never written a blog post before, but with the pressure on I thought I best get started. So lets start with an introduction to the Project Conservation Team, the better half to the Project Joinery team! I’ve got to keep up with the banter! There is myself, Lauren Jackson, Project Conservator, Christina, Project Conservation Assistant and a small team of dedicated voluntary conservation assistants (who will be named and shamed (praised) in a later blog post). 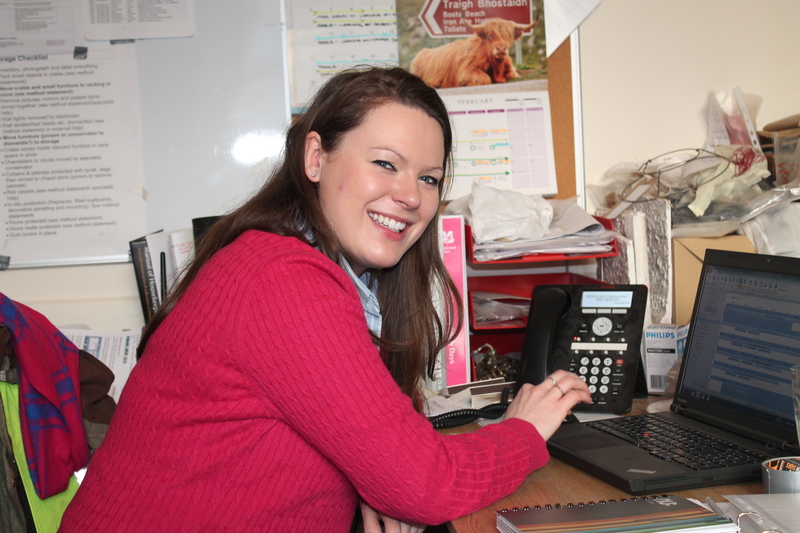 We all work very closely with the house team here; Louise, House and Collections Manager, Andrea, House Steward, Sheena, Assistant House Steward, Matthew, Conservation Assistant, Michael, Conservation Assistant and their dedicated team of conservation volunteers. Since I have arrived we have all been very busy with the movement of collections into storage and the protection of fixtures and fittings left within the rooms, to allow contractors access into the rooms to work and create lots of dust! Holly one of our volunteers giving the doors first class treatment! We have surely broken a few Guinness World Records in decanting, packing and storing collections in record breaking times, as well as engineering the most complex structures to store and protect unusual collections. We have tackled complicated deconstructions of delicate four poster beds, large bookcases, and have carefully removed VERY large delicate mirrors and paintings without any glitches. Including removing windows to fit paintings through! 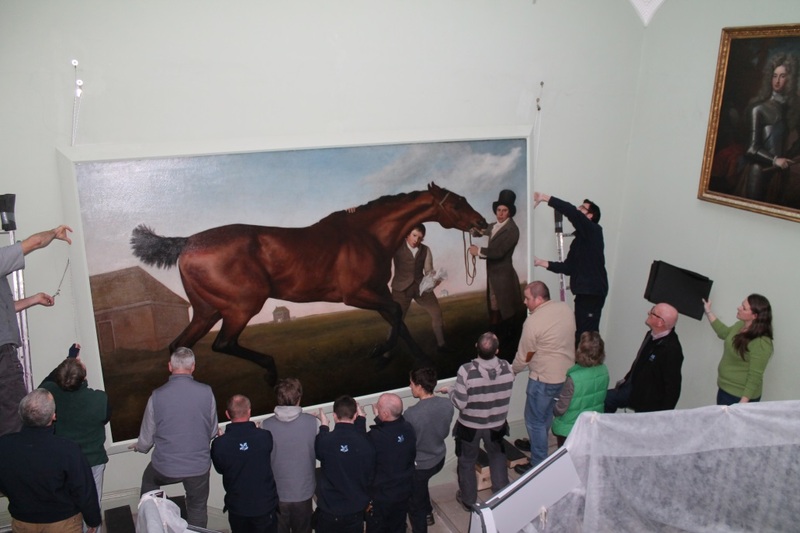 Hambeltonian by Stubbs, our most famous painting on the move, he only had to jump the stairs! Circe has her men in line to move her through the window! Fingers crossed the reinstatement of the collections at the end of the project isn’t required to be carried out anywhere near as quickly! As the Project Manager, Dennis Wright keeps reassuring me, ‘…everything will be down to the wire!’ so I am quite confident we will have plenty of time! In the short time I have been here, I am not sure what I have said or done or asked for, but I seem to have gained a bit of a reputation as a ‘slave driver’! The joinery team, in particular David, all seem to hide now when they see me coming; I am not always asking them for further structures to store collections! We have finally completed the packing and protection of the collections and Louise has commissioned an interesting exhibition showcasing the project work going on. We are now open for the summer, so do come visit and see our collections on show in store! That’s all for now, Holly one of our volunteers will follow this up with an introduction to our fabulous project conservation volunteers. This entry was posted in General information, Introductions to the project team and tagged collection, conservator, hambletonian, packing, paintings, storing, stubbs, team, volunteers by ntmountstewart. Bookmark the permalink.